The Town of Essex Tune Up The Parks series features local musicians sharing their talents with the community in local parks in Essex, Colchester, Harrow, and McGregor. The next show at Colchester Park (near Colchester Beach & Marina), featuring Ken McLachlin AKA Macsmusic takes place on Monday, September 3, 2018. All shows are free and start shortly after 7:00pm. Performances are subject to change or cancellation without notice. Mike & Tyler are an acoustic/electric duo that covers a range of songs from Gary Clark Jr. to Johnny Cash. They started jamming together just over a year ago, two old friends brought together by a love and passion for music. It started out as a fun thing to do, then quickly became more serious. Mike is the son of Tim McDonald, a local singer/songwriter from the Timmy Mac Band. Mike learned his craft from his father over his 25+ year career. Tyler self taught himself guitar over the past 12 years. 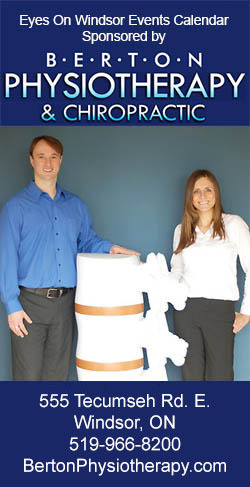 Both Mike and Tyler are born and raised in Harrow, ON, and are proud residents of the area. The Rio Michaels Trio has steadily grown a reputation for their wide variety of modern and classic country music. Their musical influences include Kenny Chesney, Gary Allan, Carrie Underwood, Patsy Cline and other chart topping artists of today. The Rio Michaels Trio appeals to everyone with its ever changing list of modern and classic country songs covering all the decades with just enough rock and dance tunes to provide some variety. Steve Morin has been writing music as a hobby for close to 40 years. After he retired he decided to start playing these songs for live audiences. Steve sings and plays guitar, banjo and harmonica. His passion is the blues but he always throws in some folk and a bit of country music. His “Friends” include Gord Harwood of Kingsville and Joel Westlake of Leamington. Steve lives in Woodslee. 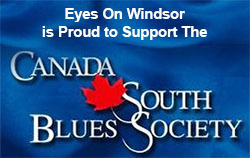 Tom Brough is a singer songwriter who hails from Windsor, Ontario. Playing in clubs and bar bands for over 20 years leaves him comfortable and at ease in front of a crowd or intimate audience. During this life acoustic performance you can expect to hear original material, an eclectic mix of cover songs from early rock and country blues as well as songs from modern artist, with a little laid back coffee house attitude. Justin Latam of Leamington incorporates many styles into his playing, including folk, rock, blues, jazz, and East Coast sounds that merge into his own unique style. He has just released his 5th album, Barefoot. Singer-songwriter Karen Morand likes her gospel gritty and her folk a little feisty. 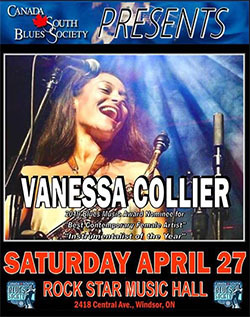 Moving comfortably between instruments, she brings her big, warm vocals to solo and collaboration projects including her Windsor-based acoustic trio, BOSCO. As a mom, teacher, pre-school folkstar and urban chicken farmer, Karen’s writes songs that celebrate the joys and broken parts of real life. Larry Affeldt, also known as Lawrence Hank, comes from a family of musicians. His father, Gord Affeldt, was the first luthier in Canada to be certified by Fender guitars for repair. Gord built guitars with Mr. Bigsby in the 50’s and would play with the likes of Johnny Cash and Roy Clark. This set the tone for a childhood surrounded by music. As years past music would change, but the desire to play stayed with Larry and his siblings. He has played everything from Patsy Cline to Iron Maiden and everywhere from Canada to Mexico. Fire is an original rock trio from Essex: Adam McClellan on guitar, Andrew Weins on bass, and Jared Porter on vocals and drums. Fire is the youngest and most impressive band playing in the area and is dedicated to keeping rock alive. Their sets include only original music reminiscent of Led Zeppelin and Neil Young, plus a mix of 90s alternative rock. No social media, live performances only! Abbey Neves is a talented young musician who has an immense passion for music. She began singing at the tender age of four, opening for the Rockettes at the Fox Theatre in Detroit, Michigan after winning a competition. Abbey has been invited multiple times to sing for the Toronto Blue Jays in Florida, and she is the American anthem singer with her mom, Margaret Slack, for the OHL Windsor Spitfires, and the 2017 Memorial Cup. Abbey has won many awards such as being the only vocalist to place in the London 2012 Junior Division of Rise to Fame, 1st place at 2014 Mitchell’s Bay Contest, and 1st place in 2014 in Wheatley Idol for both her age division and overall. Abbey has also had the opportunity to audition for The Voice. Southwest Sound is a 6-piece band that plays class country and class rock influenced by bands like the Eagles, CCR, Bob Seger, Merle Haggard, George Jones, Waylon Jennings and Willie Nelson. 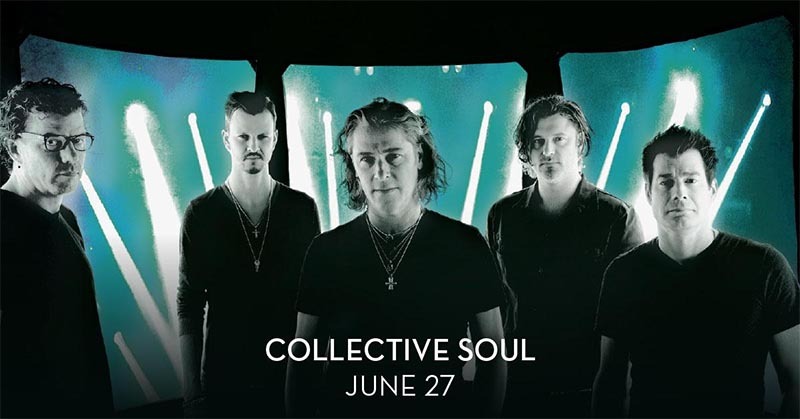 Members are Abe Quiring (lead vocals), Neil Quiring (lead guitar and steel), Kenny Foote (lead and rhythm guitar), Dave Fortin (rhythm guitar and vocals), Stu Campbell (drums and vocals), and Gord Harwood (bass guitar). The Kingsville-Essex Associated Band is Canada’s oldest continuously-running community marching band. Founded in 1937, the band celebrated its 80th anniversary in 2017. Members of all ages and levels of experience are welcome. They are the musical ambassadors of the towns of Kingsville and Essex and have represented our region in performances at the Calgary Stampede, Traverse City Cherry Festival, and Walt Disney World. They operate under the philosophy of “once a member, always a member” and new members are always welcome. Ken McLachlin is an acoustic guitar musician, folk singer, songwriter and recording artist. Hundreds of shows later throughout Ontario, eastern Canada and the U.S., Ken moved on to further explorer his solo, acoustic folk roots – where in fact, it all began. He has been writing, recording and performing his songs ever since. Performing under the moniker, macsmusic, he’s been described as an enjoyable, down-to-earth story-teller. 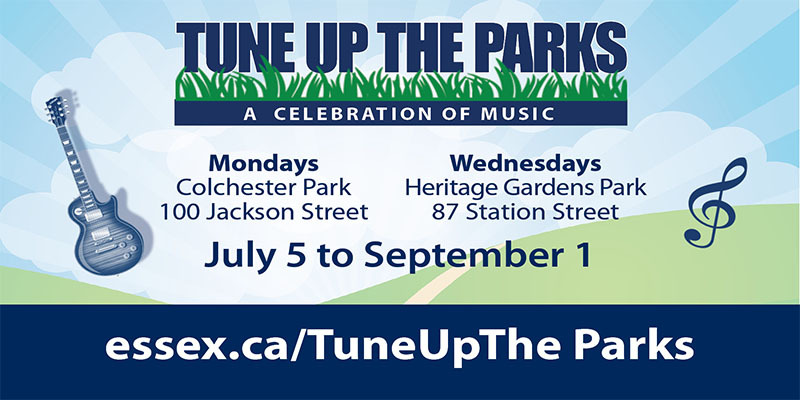 Tune Up the Parks runs weekly until August 30 – Mondays at Colchester Park and Wednesdays at Heritage Gardens Park in Essex Centre – with additional dates in Harrow and McGregor. Tune Up the Parks is a project of the Arts, Culture and Tourism (ACT) Committee.